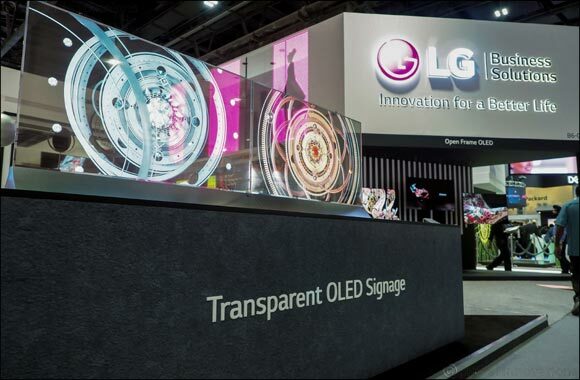 Dubai-UAE: 16 October 2018 – LG Electronics, a pioneer in developing innovative technology showcased its all-new Transparent OLED Signage at the 2018 GITEX Technology Week. The signage aims to revolutionize the retail experience by offering unique ways to captivate potential leads and covert them to paying customers. LG showcased the 55-inch Transparent OLED signage, a state-of-the-art product with razor thin bezels and the most exceptional form factor. With its seamless one-piece glass design and high picture quality, it is especially impressive in retail environments and art galleries where products can be placed behind video or special effects displayed on the Transparent OLED signage. Consumers will soon be welcomed by LG’s Transparent OLED screens in retail stores. The screens have the potential to replace store windows and be used to create advertisements, product demonstrations or simply create any form of content that can attract and engage potential customers. Recent reports have stated that the digital signage market is expected to reach USD 31.62 billion by 2023 at an estimated CAGR of 7.28%. Mr. Cha further stated that LG has been making headway in these emerging technologies, most notably with its ThinkQ products and LG robots designed to increase benefit in home comfort and lifestyle. For the hospitality industry, LG has launched in-room IoT solutions based on its Smart Hotel TV for improved hotel guest comfort. Technology is making the world smarter and more agile and if leveraged properly can accelerate an organization’s ability to capitalize on productivity, efficiency and increase profitability. In the near future, with technologies like AI, IoT, Big Data, Beacons, Proximity Sensors and more, we can be most likely make a prediction whereby potential customers can have targeted messages directed towards them as they walk into or past a store to enhance customer experience and even up-sell or promote a related product based on previous purchases – if and only if consent is provided by the customer.